Several years ago, we developed a project through the Detroit Zoological Society’s (DZS’s) Center for Zoo Animal Welfare to determine if we could identify specific personality traits in Blanding’s turtles. That’s right – turtles! 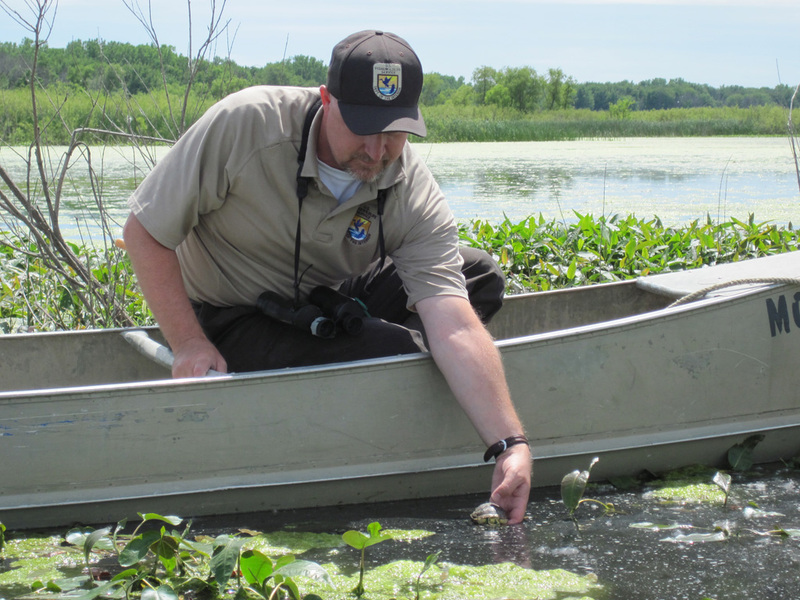 Personality has been linked to survivorship in a number of species, and as the DZS is actively involved in conservation efforts with the Blanding’s turtle – a species of special concern in the state of Michigan – we wanted to learn more. Two personality traits emerged from our research: aggressiveness and exploration, with individuals ranging from low to high in either category. We also discovered that a connection exists between these traits and how Blanding’s turtles fare in the wild. Researchers have been monitoring the population of Blanding’s turtles in Michigan for several years and making efforts to ensure their numbers don’t drop any further. Female Blanding’s turtles typically lay eggs this time of year, and they often travel rather long distances to find suitable nesting grounds. This certainly puts them at risk, especially as road mortality is one of the major threats they face. When baby turtles hatch, they must find their way back to water, which leaves them vulnerable to predation. The DZS became involved in a head-starting program for this species in 2011. This means that eggs are incubated at the Detroit Zoo and the hatchlings are allowed to grow up safely until they reach a certain size, at which point they are released back into the wild. We used a series of behavioral tests to uncover specific personality traits, including what is often referred to as the mirror test. A mirror is placed in the testing space and the turtle can choose to approach it and to interact with it. As amazing as turtles are, they cannot recognize themselves in a mirror and hence perceive their reflection to be another turtle. By examining their reaction, we definitely saw each turtle as an individual. Some were reluctant to approach, some were uninterested, some were trying to interact gently, and some were very adamant that there was only room for one turtle in the pond! Once we identified the personality traits, we wanted to understand what links there may be between personality and the turtles’ behavior and survival once released into their natural habitat. Field researchers from the University of Michigan-Flint tracked the turtles post-release for two years and shared their data with us. Based on our analyses, turtles that demonstrated high exploration had better survival rates than those who scored low in exploration. During the first year, turtles that were more aggressive traveled further from their release site, but over the entire course of the tracking period, turtles that were more exploratory traveled the most. Turtles that were rated as more aggressive and exploratory were found basking more often. Turtles will rest in the sun to help thermoregulate. This helps them to be more energetically efficient, but being exposed may put them at higher risk of predation. The different personalities therefore behave in different ways that amount to a trade-off in risks and benefits. Finally, all turtles, regardless of personality, showed a distinct preference for areas vegetated with cattails. Given this demonstrated preference, we now know that this type of habitat might really benefit turtles in future releases.